There’s no surprise that tracking and monitoring your money can lead to positive, game-changing effects for your financial health. Learn the methods to operate your money like the Chief Financial Officer (CFO) that you know you can be! Get to know the big picture and the day-to-day numbers in order to successfully manage your money. Today, I’m sharing my go-to financial tools with YOU – and they’re all FREE to use. As an added bonus, I’ll include the benefits of each tool so you can decide if it will make you a better CFO! Mint is the app I open most frequently. It’s my go-to in terms of reviewing my balances at a glance. I use Mint for the overview portion to get a full picture of all my accounts related to checking, savings, and investments. From my experience, I’ve been able to add all my accounts to the platform with ease. If you’re just getting started tracking your money, Mint is a great option. Mint has a multitude of capabilities. Review balances at a glance and all in one place >> main reason I use it! Get alerts for upcoming bills, low funds, unusual activity…and more. Personal Capital is my go-to for only my investment accounts. This includes 401k, IRA’s, taxable accounts – anything pertaining to early and full age retirement. By choice, I DON’T use it to track anything in my cash equivalent accounts, such as checking and regular savings. I already have Mint taking the spot for a “view of all accounts”, so I use Personal Capital for investments only. For investments, the analytical interface is appealing and useful for a quick view of what’s happening. I highly recommend it! Here’s why Personal Capital is a great option. Investments overview and analytics >> main reason I use it! Use it for ALL accounts or only for investments. View cash flow, net worth, account balances and transactions…and much more. Retirement and Financial check-up tool that shows progress! See below for screenshots taken from the desktop version. 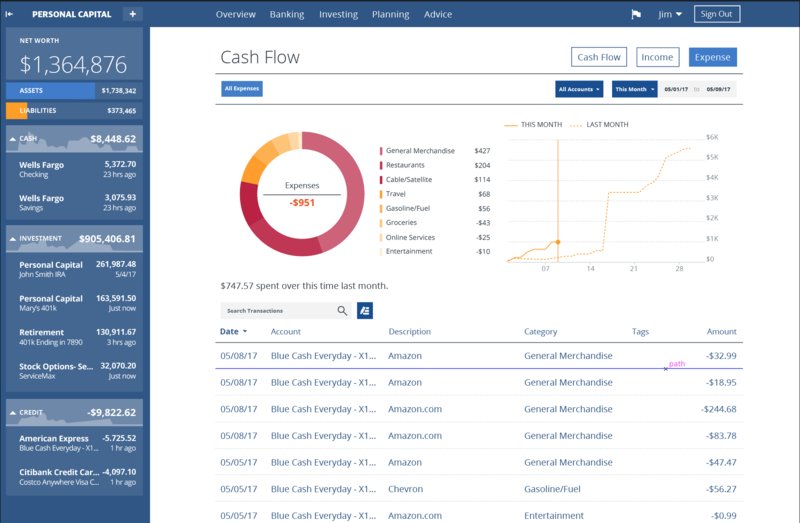 Cash flow can also be tracked, as you can view from the visual below. The view below is for the Retirement Planner. The tool recently rolled out in the app and you can believe I used it to measure my retirement viability. 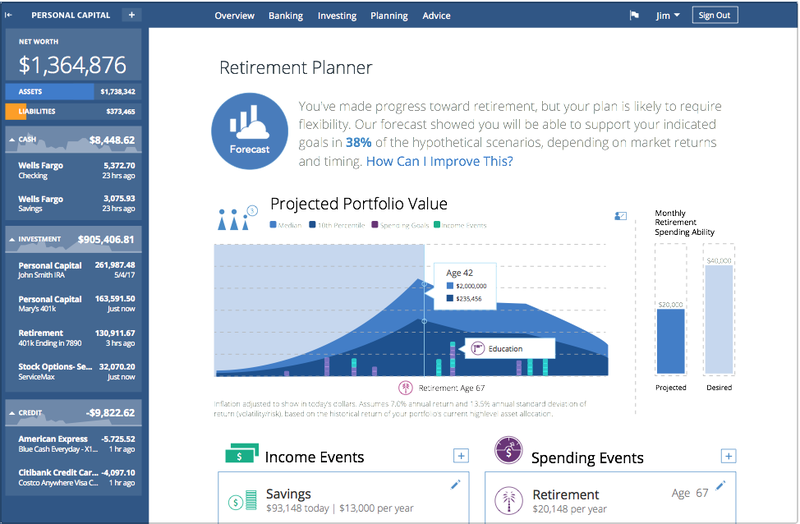 It worked wonderfully for me, feel free to try it yourself >> Retirement Planner. Get it, SigFig – Significant Figures. It’s certainly a clever name. SigFig is very similar to Personal Capital due to the analytical tools provided for investment purposes. It provides performance related information with daily movers and a portfolio breakdown. I use SigFig mainly through the widget that you can add to your cell phone. When I swipe right, it provides me with my full portfolio balance and the daily change for the DOW, S&P, and NAS, as well as the daily movers. I normally check throughout the day for information as to if the market is up or down for the day. SigFig is a good “extra” to add to your financial tools. Get info on daily movers and track “gainers” and “losers”. Use for investments ONLY to get a full view >> main reason I use it! Gain insights from thorough analytics. Includes widget to view daily movement. View of performance over Lifetime (MAX), 1 year, YTD, 6M, 5D, 1D. I use both Credit Karma and Credit Sesame in order to view my credit score at any time – it’s FREE! I normally check my credit score once a month. There is a set date/time that the score resets, and I get email alerts, but I generally just check when I think about it. They both provide data from a couple of the credit reporting agencies (ie. Transunion, Equifax or Experian), so you can readily compare your reports for each agency. Track credit score on a regular basis. Be aware when there’s an issue that needs to be resolved (vs. finding out when making an important purchase). New FREE Vantage Credit Score every 30 days. >> main reason I use it! → If you want to learn more about credit score fundamentals + tips to boost your score, check out my article! For my main financial needs, I use a spreadsheet. This includes budgeting, tracking expenses, and various other calculations and recordings. I particularly like using MS Office Excel. As an Accountant, it’s a tool that I’ve become accustomed to in my line of work. I use it to personalize how I want my budgeting and tracking to look and function. There are other spreadsheet tools out there if you are unable to get access to Excel. Some of the alternatives are Google Sheets, Numbers for Mac, Apache OpenOffice, and LibreOffice. Google Sheets is very similar to Excel. You can access it through a Google account. It provides you with a FREE alternative to Excel and you get most of the same capabilities. For FTD readers, I have the “FTD Budget and Tracking Spreadsheet” available as a free download. I currently use it for my own needs. It’s incredibly useful. View of income, expenses, and net profit at the monthly and yearly level. History of transactions for everything that is booked. Know how much money is being spent for each category, over/under budget…and more! Make changes and customizations easily with additions of rows, columns, tabs, etc. You can check out more specifics and get your own copy using the link below. That’s a rundown of the financial tools I use on a frequent basis. It’s been a game changer to have quick access to all my accounts with a swipe of a finger. I remember early on when I used to have to log-in to each account to get all my info. What a pain was that! Using financial aggregators such as Mint and Personal Capital cuts down on having to manually check on each account. Now, checking all my accounts is SO simple. I can catch a discrepancy early on to alert the entity of the issue and move on with life. It’s important to note that if you are just starting out, use what works best for you. As long as you keep this in mind and are eager to start managing your financial health, you are on the right track! I’m curious to know – what financial tools do you use that I must know about?! Please comment below!